The stock market turned in a mixed performance for the week with the Dow Jones Industrial Average and the S&P 500 Index both recording new all-time highs while the technology-laden Nasdaq Composite Index and some of the smaller-cap indexes recorded modest losses. The bond market slid lower with yields rising. The solid performance in larger-cap stocks took place as investors shrugged off a further escalation in the trade conflict between the U.S. and China. Last Monday evening President Trump announced the U.S. will be enacting tariffs on $200 billion worth of Chinese goods beginning September 24 at an initial rate of 10% that will increase to 25% on January 1, 2019. The president also declared he will impose additional tariffs on $267 billion worth of Chinese goods if China retaliates, which it stated it would do with 5-10% tariffs on $60 billion worth of U.S. goods. Stocks traded unexpectedly higher on Tuesday following Monday’s tariff announcement as a number of analysts suggested the initial 10% tariff rate by the U.S. was not as severe as expected and appeared to be a negotiating strategy. Regardless, investor activities likely reflected the market's conviction that the trade disagreements between the U.S. and China will eventually be resolved. 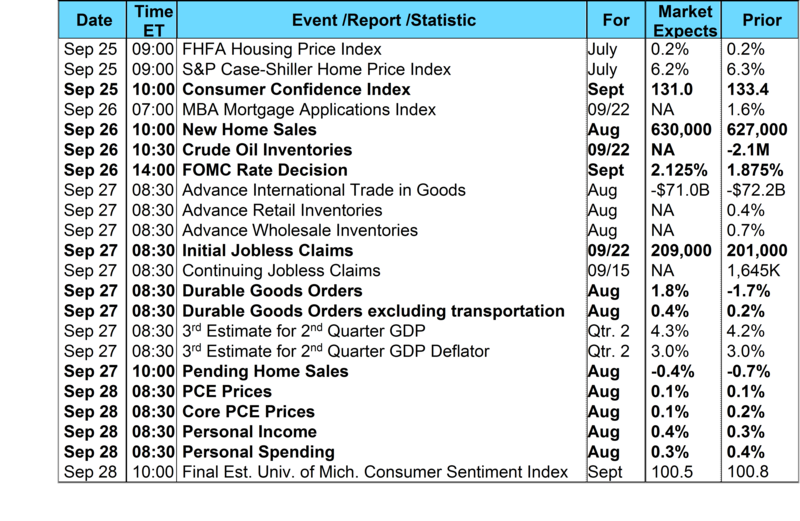 Wednesday, the Commerce Department reported Housing Starts rose 9.2% in August to a seasonally adjusted annual rate of 1.282 million, exceeding the consensus forecast of a 1.229 million annual rate. However, monthly housing starts numbers are notoriously volatile and August’s housing starts number was driven by an outsized spike in apartment building that camouflaged weakening across single- and multifamily construction. Single-family housing starts in August increased by 1.9% to a seasonally adjusted annual rate of 876,000 units while multifamily starts skyrocketed 27.3% to an adjusted annual rate of 392,000 units. The 27% spike in multifamily starts inflates top-line numbers and covers a developing down trend in permits issued. Thursday, the National Association of Realtors (NAR) reported Existing Home Sales held steady in August at a seasonally adjusted annual 5.34 million pace, a rate that was unchanged compared to July. Total sales were 1.5% lower than a year ago, and although sales seem to have grind to a halt in 2018, in the year-to-date reading they’re only 1.2% lower than the same period a year ago. The flat reading missed the consensus forecast of a 5.37 million rate. However, the National Association of Home Builders/Wells Fargo Housing Market Index (HMI), a measure of home-builder confidence, may portray current housing-market conditions the best. Survey results are transformed into an index where any score over 50 indicates more builders view conditions as good than poor. Tuesday, the September HMI was reported at a solidly positive 67 matching August’s number. The HMI index measuring current sales conditions rose one point to 74 and the component gauging expectations in the next six months increased two points to 74. Further, the metric charting buyer traffic held steady at 49. Moving forward, there are expectations for some housing market disruption effects due to the impact of Hurricane Florence. Single-family construction in North Carolina, South Carolina and Virginia makes up 12% of national production. Elsewhere, the latest data from the Mortgage Bankers Association’s (MBA) weekly mortgage applications survey showed an increase in mortgage applications. The MBA reported their overall seasonally adjusted Market Composite Index (application volume) rose 1.6% during the week ended September 14, 2018. The seasonally adjusted Purchase Index increased 0.3% from the week prior while the Refinance Index increased 4.0% from a week earlier. Overall, the refinance portion of mortgage activity increased to 39.0% from 37.8% of total applications from the prior week. The adjustable-rate mortgage share of activity increased to 6.5% from 6.4% of total applications. According to the MBA, the average contract interest rate for 30-year fixed-rate mortgages with a conforming loan balance increased to 4.88% from 4.84%, its highest level since April 2011, with points decreasing to 0.44 from 0.46 for 80 percent loan-to-value ratio (LTV) loans. For the week, the FNMA 4.0% coupon bond lost 26.5 basis points to close at $100.844 while the 10-year Treasury yield increased 6.60 basis points to end at 3.066%. The Dow Jones Industrial Average gained 588.83 points to close at 26,743.50. The NASDAQ Composite Index lost 23.08 points to close at 7,986.96. The S&P 500 Index added 24.69 points to close at 2,929.67. Year to date on a total return basis, the Dow Jones Industrial Average has gained 8.19%, the NASDAQ Composite Index has advanced 15.70%, and the S&P 500 Index has added 9.58%. This past week, the national average 30-year mortgage rate rose to 4.85% from 4.74%; the 15-year mortgage rate increased to 4.30% from 4.22%; the 5/1 ARM mortgage rate rose to 4.05% from 4.02% while the FHA 30-year rate increased to 4.48% from 4.42%. Jumbo 30-year rates increased to 4.40% from 4.37%. 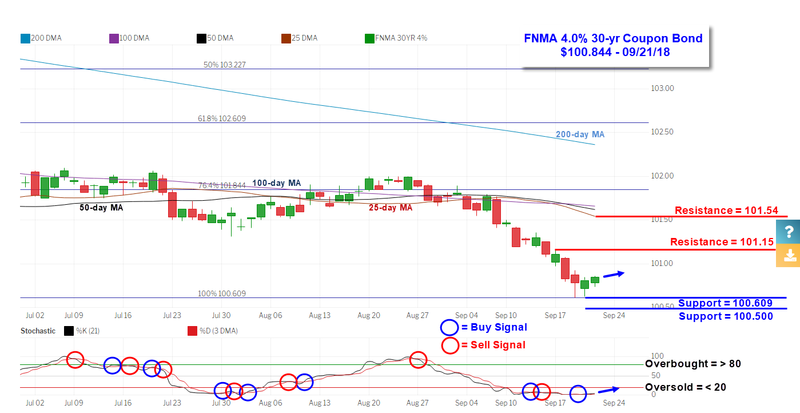 The FNMA 30-year 4.0% coupon bond ($100.844, -26.50 bp) traded within a wider 54.7 basis point range between a weekly intraday high of 101.156 on Monday and a weekly intraday low of $100.609 on Wednesday before closing the week at $100.844 on Friday. Mortgage bond prices trended lower until reaching technical support found at the 100% Fibonacci retracement level located at $100.609. The bond then made a small bounce off of this support level on Thursday and Friday resulting in a weak buy signal. The bond remains extremely “oversold” and thus could continue to make a run higher toward resistance at $101.15. Such a rebound toward nearest technical resistance would have a positive influence on the mortgage bond market resulting in slightly lower rates.